Dinosaurs. This was reporter Lauren’s and my first assignment together since covering Newtown. © 2013 by The York Daily Record/Sunday News. 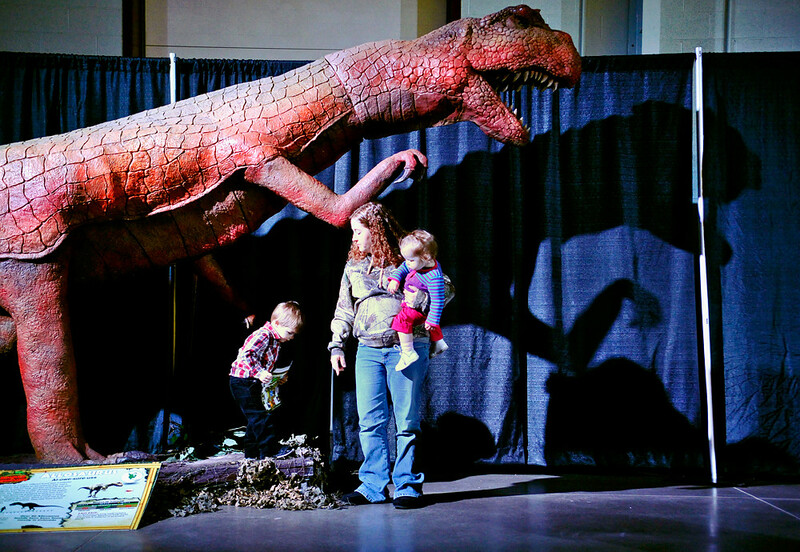 Holding daughter Sophie Hewitt, 1, in one arm, Jessica Fahringer of Wrightsville coaxes son Lucas Hewitt, 2, to stand with her for a picture underneath an Allosaurus dinosaur model in the “Discover the Dinosaurs” traveling exhibit on Friday, Feb. 1, 2013, at the York Expo Center. It was basically a big traveling exhibit of dinosaurs. No one in the newsroom was excited about it except for editor Kate and me. Me, I love dinosaurs. Everyone else, though, was hatin’ on it. Turns out — if you read the comments on our story and a Facebook page dedicated to it — a lot of people hate on this exhibit. I’ll let you judge.